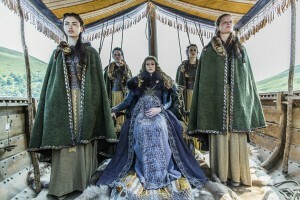 Season Two of HISTORY’s hit scripted series VIKINGS is around the corner premiering Thursday, February 27 at 10 p.m. and below is a link to three new images. 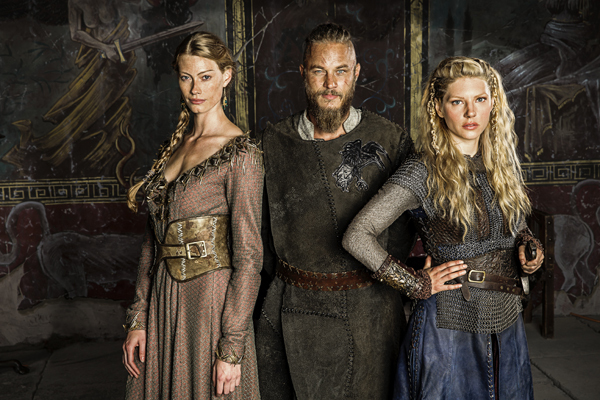 At the conclusion of season one, Ragnar (Travis Fimmel) was unfaithful to his wife Lagertha (Katheryn Winnick) with Princess Aslaug (Alyssa Sutherland). These new photos may shed some light into how Ragnar’s lady troubles could play out in season two. 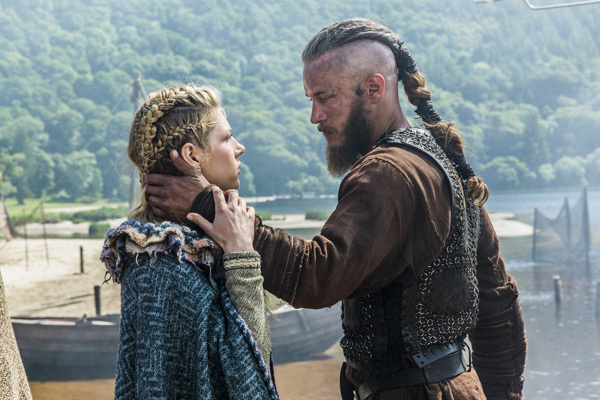 Will Ragnar’s indiscretions with Lagertha threaten his marriage? Will Lagertha stay by her husbands’ side or leave him? In episode one airing on 2/27 Aslaug makes her way to Kattegat and brings with her a surprise that leaves Ragnar in a difficult predicament. Who will he choose? You’ll have to tune-in to find out, but this house of cards is surely set to come crumbling down as Ragnar tries to juggle his complicated love life and his sudden ascent to greatness. Last spring, HISTORY® introduced viewers to a clan of Norse warriors with a rapacious appetite for warfare, knowledge and power. The gripping family saga of Ragnar, Rollo, Lagertha, friends and enemies was a tale of brutality and passion, alliances and infidelities, infighting and death. It portrayed life in the Dark Ages, a world ruled by raiders and explorers, through the eyes of Viking society. The epic tale continues in 10 all-new episodes of VIKINGS. The hit scripted drama series centers on Ragnar (Travis Fimmel), a restless young warrior and family man who longs to find and conquer new lands across the sea and claim the spoils as his own. Now he is an Earl, allied with King Horrik (Donal Logue). With more power than ever before, his desire to sail west and explore new kingdoms remains unquenchable. Yet there’s a heavy price to pay for Ragnar’s ascent to greatness. Season two brings crises of faith, of power, of relationships. Brothers rise up against one another. Loyalties shift from friend to foe, and unlikely alliances are formed in the name of supremacy. Plots are hatched, scores are settled, blood is spilled…all under the watchful eyes of the gods. New to the cast of VIKINGS are Alexander Ludwig (The Hunger Games) as Bjorn, the intelligent and bold warrior son of Ragnar Lothbrok, and Linus Roache (Law & Order) as Ecbert, King of Wessex, a man of strength, knowledge and undisguised ambition. They join Travis Fimmel as Ragnar Lothbrok; Katheryn Winnick as Lagertha, a fierce shield maiden and Ragnar’s wife; Clive Standen as Rollo, Ragnar’s impulsive, wild, care-free brother; George Blagden as Athelstan, a young and not-so-innocent Monk; Jessalyn Gilsig as Siggy, beautiful wife of the late Earl Haraldson; Donal Logue as King Horrik, who desires to make the increasingly famous Earl Ragnar an ally and supporter; Gustaf Skarsgard, a ship builder who designs the new generation of Vikings ships; and Alyssa Sutherland as Princess Aslaug, Ragnar’s new love interest. Print article This entry was posted by Art Eddy III on January 22, 2014 at 2:11 pm, and is filed under Entertainment. Follow any responses to this post through RSS 2.0. Both comments and pings are currently closed.